In 2011 the first challenge we faced was the creation of a central digital estate in the form of the Government Digital Service. The next challenge was to fix publishing. 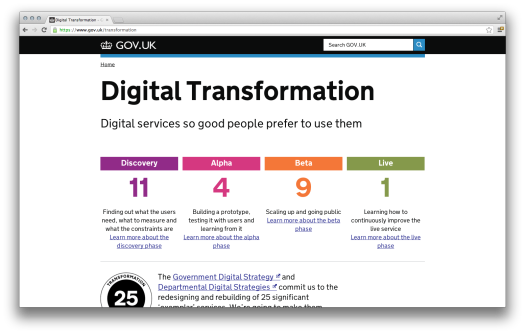 Launched in October 2012, GOV.UK is now an award-winning digital service which will continue to grow as over 270 more government agencies and bodies migrate onto it in the next twelve months. Since January 2013 our primary focus has been on the third challenge: fix transactions. That means digital transformation - rebuilding government services for the way people live today. Put simply, it should be as easy to manage your tax online as it is to bank online, and as easy to transfer ownership of a car online as it is to sell a car online. We've started work on redesigning 25 of the biggest and most-used transactional public services - we call them exemplars, leading the way for others to follow. 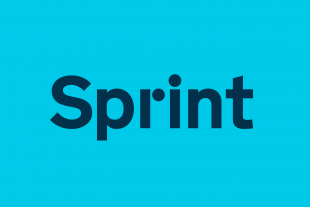 At Sprint Alpha today Ministers, Civil Service Leaders and teams from all over the country are showcasing some of the features we’re already built for those services. People are seeing the live, working software that’s already making government services Digital by Default. We are running this programme of continual iteration in the open. You can follow our progress at www.gov.uk/transformation, where we’re regularly publishing information about every exemplar. You’ll see performance data, screenshots and status reports of where each service is at, and we’re going to add more to it as each service progresses. It’s in beta, so send us any thoughts, suggestions or errors you see. You’re going to hear more about the transformation programme from Mike Beaven tomorrow. We’ll also be posting more updates on some of the work we’ve completed so far, including footage from the Land Registry’s ‘alpha in a day’ and updates from some of the teams we’re working with across the country. There’s still a huge amount of work to do, but we’ll tell you more about it week by week as the transformation of government services continues. The 'First are you are sort of person' stage of the Universal Credit Pathfinder application (Exemplar #14) asks 25 questions. Any user who actually is entitled to claim Universal Credit, but who makes a mistake answering any of those questions, is taken to a dis-entitlement page. This page does not give the reason for dis-entitlement. Nor does it offer a mechanism for users to return to or amend their answers. There is no application provided back button. Clicking the browser's back button inappropriately shows a warning that data may be lost. In fact, the data is already lost - to have another go, users must start from the beginning, capcha and all. Repeated efforts to navigate result in a warning that the service is temporarily unavailable, further discouraging potential claimants from trying again. Users who fall into this trap are advised to investigate claiming alternative benefits - which may not in fact be available to them. Having no way to check their answers, they may well have no clue that they have entered incorrect data. * preceding the dis-entitlement page with a summary of the information entered thus far - interestingly, claimants who do pass the first stage *are* shown such a summary and asked to confirm the details they have just entered, suggesting that this part of the system may have been designed for the convenience of the processor rather than the user.